Firstly, this is not a defense of Walid Phares DC. The man’s record as scholar and public intellectual speaks for itself. What is so objectionable in these, the skeletons in the closets of Phares’s youth? And what would have Phares’s sanctimonious detractors preferred he had done: Lent a hand in drafting the Communist Manifesto? Signed the PLO Charter? Founded the Arab League? Those are of course paragons of enlightenment and tolerance and liberalism from the purview of Phares’s “left-wing” censors, and had Phares been the wiser in his younger years, he ought to have associated himself with these pinnacles of humanism—rather than the illiberal Lebanese Front and its hateful platform. This would have at least spared him the oh so damaging “right-wing Christian” label. You see folks, at the heart of this whole idea of a collapsing Middle East in our times, is a century or more of failures of analysis, interpretation, and policy issuing from a catastrophic insidious failure of language. This is no more evident than in today’s euphemisms and newspeak and misnomers in reference to things and peoples and events Middle East. From such inanities as “the Arab world” or “Muslim world,” to modern pearls of wisdom such as “violent extremism” and the very concept of the “Middle East” itself as a uniform universe of Muslims alone, or Arabs alone, all of the preceding are indeed at the heart of our (Western world’s) continued disastrous misunderstanding of the Middle East. And those attempting to slander Walid Phares today prove themselves worthy children of this Orwellian universe of inverted realities and semantic perversions. 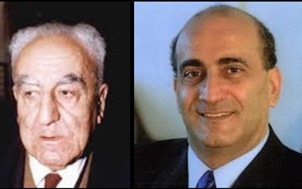 To wit, publicist Leon Hadar recently described Phares as “an academic who was involved with right-wing Christian militia groups during the Lebanese Civil War.” Beyond what I mentioned above, I am not qualified to weigh in on whom and what Walid Phares was involved with more than a quarter century ago. But, “right-wing Christian militia groups,” and “Lebanese Civil War”? Seriously? That’s the chosen language of a sophisticated interpreter of the Middle East? Let’s see! Had Hadar bothered scratching more than just the surface of modern Lebanese and Middle Eastern history, and had he attempted doing more than the usual regurgitation of lazy clichés—most made current by resentful professors who still think we’re in Woodstock—he might have noticed that Lebanon’s complexities could use more nuance and more thoughtful scrutiny than the hackneyed bromides of overgrown hippies stalled between seasons. I shall not linger long on Hadar’s buzzwords, but “right-wing Lebanese Christians” is an oxymoron, and as any honest student of history would tell you, it was indeed Lebanon’s Christians who introduced liberal ideas—from women’s lib, to socialism, to secularism and the rest—into the Middle East, from the nineteenth-century on. Likewise the term “Lebanese civil war”—as, again, any honest student of history would recognize—is a disingenuous abusive and mendacious description of Lebanon’s conflicts of the 1970s and 1980s. Conflicts at the heart of which were Syrian and Palestinian armies and a motely crew of their fellow travelers, attempting to dismantle the Lebanese state. The following quotes from Bernard Lewis (a legitimate historian who actually READS text, in more than a dozen Middle Eastern and Middle Eastern related languages,) and Theodor Hanf (a social scientist who has actually published empirical work, and HASN’T an axe to grind) bear out the above—and ought to, like “a couple of Vodker’n Tonics,” set Hadar’s record on his feet again. Likewise Hanf noted that this flawed and misleading reduction of politics and the politics of identity and conflict (in Lebanon and elsewhere in the Middle east) to familiar Western ideological frameworks (eg, Left-wing Muslims vs. right-wing Christians) has become a sad hallmark of journalism and scholarship in the West. But again, those notions are disingenuous, and in Hanf’s works they are “political and social fantasies [that] correlate with the analyst’s [own] convictions,” not Lebanese realities. “The cliché of rich [right-wing] Christians and poor [left-wing] Muslims has had a brilliant journalistic career” noted Hanf, and this recent smear campaign mounted against Phares bespeaks the fact that these journalistic fairytales, tempting as they are, may not be over yet; but this hardly proves they carry any foundation in reality. That being said, perhaps Hadar and fellow travelers would care to know that the TRUE “left-wingers” in Lebanon, the people who gave Lebanon the week-end, the forty-hour work week, paid holidays, a welfare and social-security system to name only those, were the SAME folks that the “righteous” refer to as “right-wing Christians.” Likewise, Hadar’s presumed “left-wingers” (at least those often referred to as “leftists” in the media and normative Middle East scholarship) were such feudal sectarian formations with such “ideological” names as the “Parti Socialiste Progressiste” (a Druze party), or the “Baath Arab Socialist Party” (a patently Fascist formation), or Hezbollah, Amal, and the rest (openly theocratic groups, and therefore—all of which, I presume, must be “leftist” parties in the warped universe of these past hundred years of failed Middle East analyses, interpretations, and policies. In that sense, NOT only do decent analysts and policy-makers seriously interested in understanding the Middle East NEED Walid Phares! Indeed, Walid Phares is crucial to the very sanity of political classes and intellectual communities gone unhinged in this sad age of the scoundrel." Dr Frank Salameh is Professor of Near Eastern Studies at Boston University author of Language Memory and Identity in the Middle East.